Staying in the know of the latest trends is always helpful, especially when the information comes from a highly credible source such as Shutterstock. 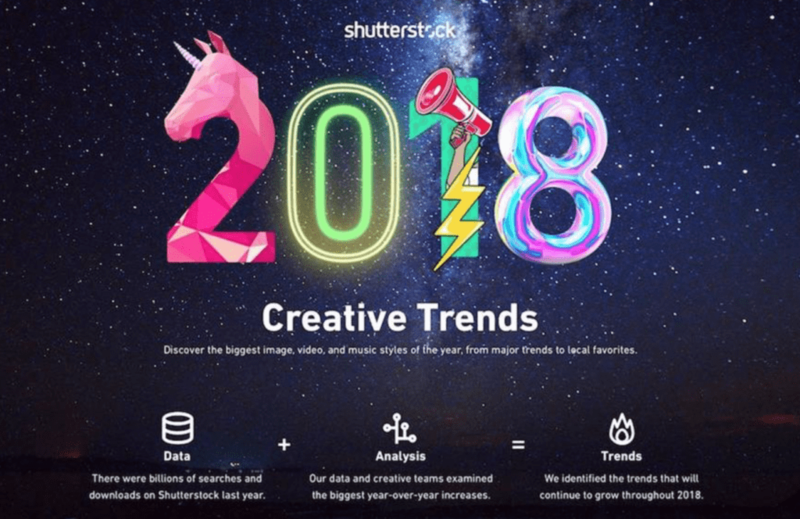 Every year, Shutterstock comes up with trends to watch out for the new year based on the popular trends that dominated the previous year, as well as emerging ones that are bound to burst into the design scene in no time. 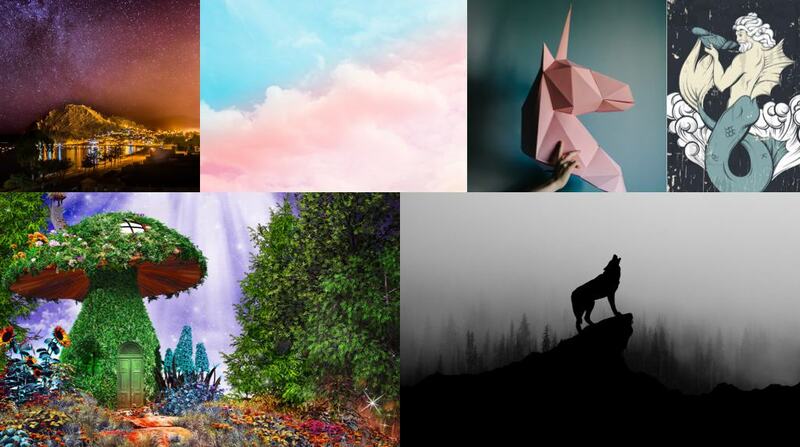 If you’re looking to update your design game, whether it’s for your website, social media content, promotional materials, or what have you, then you’ll find it most beneficial to take a look at these 11 creative trends to watch and get excited about this 2018. Thanks to the increasing appeal of this beloved genre, fantasy is making a comeback in the form of magical landscapes, mythical beasts, and so on. In fact, Shutterstock reports that searches for unicorns and mermaids rose up to 297% and 145% respectively. And with the continued patronage of pop culture to fantastical themes, we can expect to see more of these enchanting narratives through images and design in the months–or even years–to come. The minimalist movement in design has been evolving ever since it hit big in the mainstream. This time around, minimalism isn’t just black and white. 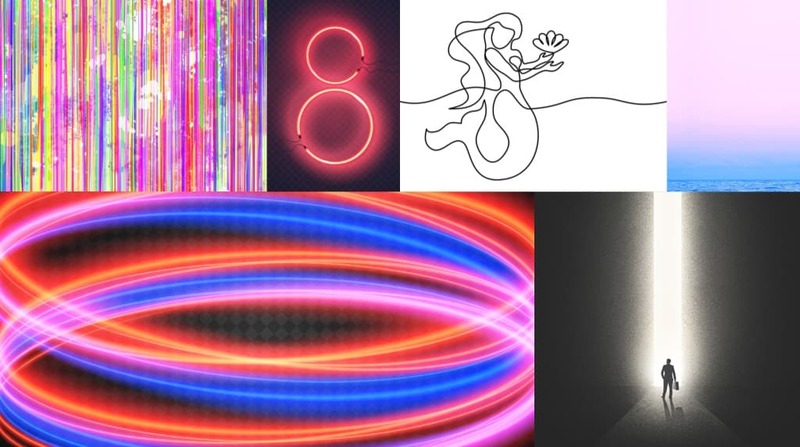 Instead, it’s comprised of vibrant colors and fluid styles that add a little bit more texture and boldness to this design genre with searches for ‘continuous line’ and ‘neon circle’ seeing a substantial increase of as high as around 400%. 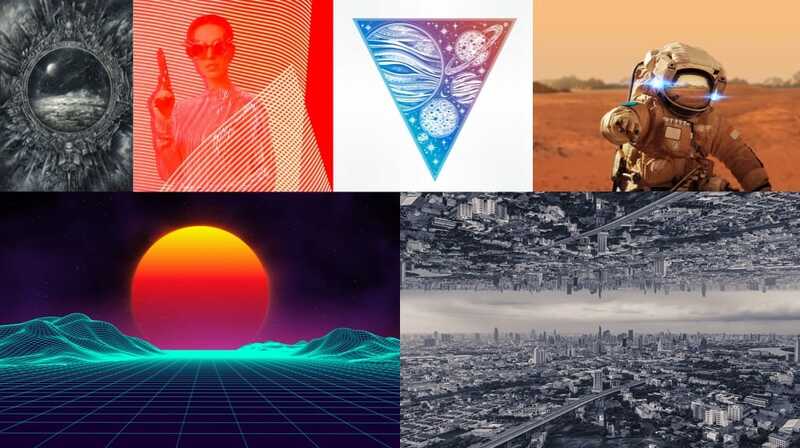 Perhaps we can thank the fascination for sci-fi within pop culture for the rise in search queries for space-related themes, including solar, astro, and synthwave. Movies like Star Wars and Star Trek, as well as some Marvel blockbusters that explore the universe, definitely feed into the imagination of the public and increasing interest in the beauty and mystery of the galaxy beyond our planet. If you’ve been spending some time on Pinterest, it’s likely that you’ve encountered several inspiration pegs that included marble. This, in fact, is considered as part of the increasing interest in natural forms of luxury that also includes ripples of agate in addition to those mesmerising marble swirl designs. Oftentimes, these can be found used in housewares and paper goods. Pastels have reached a whole new level of cool as these subtle hues are now mixed together to create a dynamic and somewhat rebellious color schemes that just pop out on the screen. There’s definitely nothing subtle about these pastel shades as the demand for juicier sets of pastel colors such as ‘blue candy’ are topping search queries. 2018 is definitely the year that the world becomes “woke,” as they say. As the battle for equality continues with International Women’s Day, as well as other relevant causes involving the society and the government, the trend of being involved with these marches and protests have reverberated through various forms of arts and design as well. In line with natural luxury, another leading candidate in terms of natural trends is the cactus. There’s just a certain lackadaisical yet edgy and cool vibe that’s associated with this desert plant that draws in new age connoisseurs. Whether it’s used for rendering, backdrops for photography, design themes or inspirations, there’s no stopping this design tend from hitting it big in the mainstream. Think your elementary or high school arts and crafts, but digitised–as it turns out, it really looks very hip and modern. Digitised embroidery and paper art are dominating design trends as these beloved patterns are reinvented to fit today’s interest for the whimsical and the need for more texture depth. Not to mention, the vintage and homey feel that these crafts offer provide a contrast to the more rigid, tech-inspired designs. It’s next to impossible to not have something from the past included in these kinds of trend lineups. Lo and behold, the ancient-inspired geometric patterns and designs are raking it in search queries with key searches such as arabesque (with a whopping 8,536% increase in searches! ), guilloche, and mandalas. Even if these designs have such diverse cultural, spiritual, and even mathematical origins, you can bet that it’s loved and adored universally. Digital economy? Yes, please. Cryptocurrency has reached an all-time high in 2017 and it’s safe to assume that it’ll continue to rise in popularity among the masses this 2018. Not only are people envisioning a world with a prevalent digital economy, but they’re also big fans of cryptocurrency-inspired images and design across several platforms. Another blast from the past that’s making waves this year is the holographic trend, which is reminiscent of the glitz and glamour of the 80s with a hint of sci-fi vibes. The great thing about this trend is how versatile it can be and how it can look playful or serious, modern or retro, funky or sophisticated, all at the same time. So which among these creative trends is, or are, your favorite/s? One way or another, we’ll certainly be seeing more of these gorgeous thematic design trends as we dive deeper into more of what this new year has in store for us, so feel free to have fun, experiment, and play around with these design trends to look out for.